Mirrodin? F*** it. 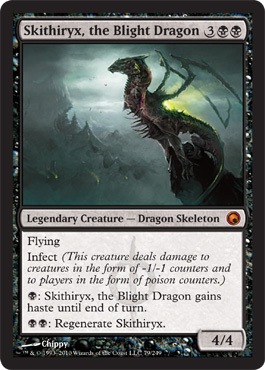 Phyrexia is back. When I first started playing Magic, the game had a story. It wasn’t just a quick glimpse though a single block such as what we’ve seen since the end of the Invasion block. It was a story spanning many blocks. In this story, there was a strange artificial plane called Phyrexia. 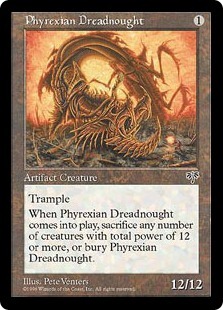 Players mostly caught glimpses of Phyrexia through a smattering of artifacts in various sets, often offering great power but demanding an equally great sacrifice. However, Phyrexia and it’s inhabitants would soon force their way onto the plane of Dominaria, the plane where the Magic storyline took place. The final set of the Mirage block, Weatherlight, featured the creation of the Weatherlight’s crew and their search for the pieces of the Legacy in preparation for the Pyrexian invasion. The Rath cycle continued the story of the Weatherlight and the assembled heroes as they assault the plane which would be the platform for the attack. The Urza’s block focused on the planeswalker Urza, mortal enemy to Phyrexia’s master, Yawgmoth, and his search for allies and artifacts capable of holding off the impending Phyrexian invasion. The Masques block continued the story of the Weatherlight’s crew (kind of). Finally, the Invasion block saw the actual, massive attack on Dominaria and Yawgmoth’s eventual defeat at the hands of Urza and his allies. Hints of the who the Phyrexians were hidden in cards since the Ice Age block. Three blocks focused on the coming invasion. The invasion took an entire block for itself. I drifted out of magic by Apocalypse anyway, so I didn’t notice the story of the Dominaria I knew come to a close with the victory of the Coalition over Yawgmoth. Apparently, with the Odyssey and Onslaught blocks, players traveled to a harsh, future Dominaria. 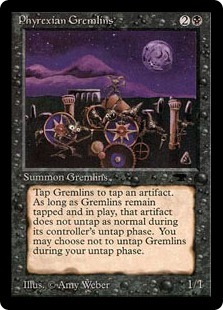 Wizards then dropped the storyline entirely, opting to stell short stories as each block visited an entirely new plane. Since then, not much of the old plane has been seen. 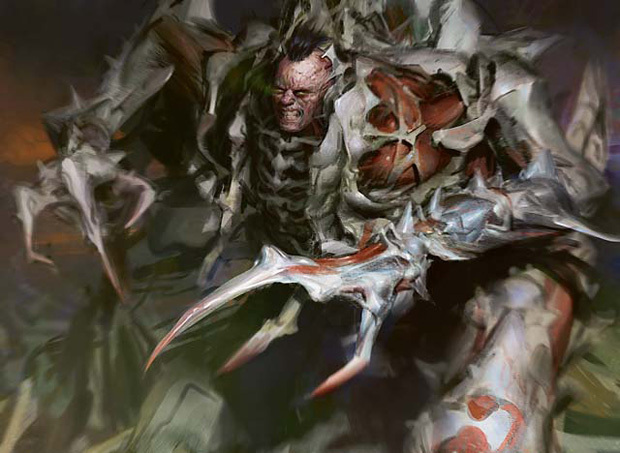 Karn, the Silver Golem, creator of Mirrodin was a key player in Phyrexia’s defeat. In Time Spiral block, players got a glimpse of a shattered Dominaria; a victim of centuries of struggle. It was during Time Spiral I started playing again. I was a little depressed by the story. Not that I was a huge Melvin. I didn’t read the books. It was just neat to have this evolving storyline and characters to follow. It had to end sometime. I’m sure Wizards and the players were getting tired of Dominaria. After all, 4 blocks and the Weatherlight set is a long time. It just never felt the same though. I felt like those people who came home to find a strip mall built on their old neighborhood. Sure, the new stuff is cool, and the game is about the cards, after all. I just felt as if something was missing. It is hard to invest yourself in a plane if you’re only there for a year. The stories were neat, the villians were cool, but they just weren’t as cool. Call it the “Darth Maul Effect”. It is just hard for something to have an impact when you know it isn’t going to be around much longer. Darth Vader Yawgmoth, now there’s a villain. Pyrexia knows how to start an epic struggle. Nice and slowly. I’m glad to see it creeping back. A familiar villain can be a lot of fun. Mirrodin is a natural fit for Phyrexia. 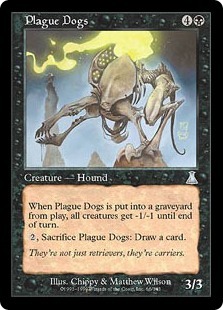 It is an artificial plane, like Phyrexia was. It is constructed of metal, much like Phyrexia was. Karn, was instrumental in Yawgmoth’s defeat, and it is through him the new Phyrexia will born. Of course it won’t be like the old Phrexia, obviously. Yawgmoth is dead. His followers and the plane destroyed. Only the plane’s foul, oily taint survived. It is, in nature, like old Phyrexia, and has begun to change Mirrodin. I may be looking at things through ichor-tinted glasses, but even the new mechanics are Phyrexian in nature. Sure, they’re Mirrian too, but how different are the too planes, really? Metalcraft: If you control 3 artifacts, do X. So far, we’ve seen metalcraft give bonuses and activate abilities on creatures an artifacts. The cumulitive power of artifacts is obvious on Mirrodin, but the Phyrexians were partly machine too, and their sheer numbers gave them power as well. Imprint: Discard X to give X some quality of the discarded X. We haven’t seen a lot of imprint abilities yet, but usually they involve creatures mimicking or becoming another and artifacts gaining the ability to cast discarded spells. As I recall, mimicry was one of Phyrexias favorite tricks. Infect: Creatures (and possibly spells) with the infect mechanic do damage as either -1-1 counters (to other creatures) or poison counters (to players). I believe 10 poison counters equals a game loss, and as of yet there is no way to remove them. This one is purely Phyrexian. 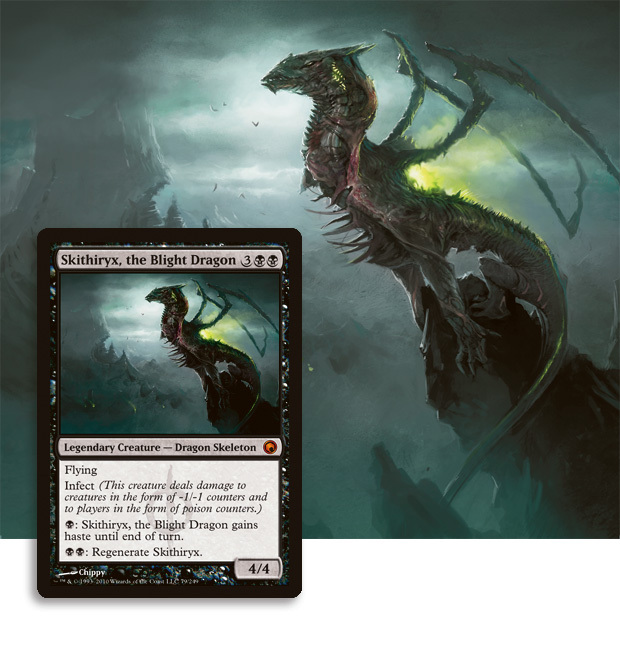 Infectious plagues and terrible poisons were Phyrexia’s most terrible weapons, and their deployment killed thousands of Dominaria’s defenders in an instant. Hundreds of thousands died slowly from the after effects. Yawgmoth himself, once a healer and a medicine man, manifested himself as a colossal cloud of toxic gasses during the final battle with Urza and his champions. Proliferate: The Proliferate mechanic adds counters to anything that already has counters. The player controlling the permanent or spell with proliferate gets to choose which permanents this effects. Did I mention Phyrexians relied on great numbers and the spreading of plagues? While I’m gushing about Phyrexia, a few other familiar things come with Scars of Mirrodin. The return to the plane Mirrodin, for one. I believe it is the first time we’ve returned to a plane since the Onslaught block. Charge counters return, as do the Myr. The set, of course, will be mostly artifacts, but colored spells do exist. Spell bombs are back again, as is the indestructible Darksteel. All of Mirrodin’s races are still there. Mirrodin is exciting too, I guess. I didn’t get to play Mirrodin 1, so I’m looking forward to the artifact centric Mirrodin 2.0. I just wouldn’t be as excited if Phyrexians weren’t involved. The cards are looking pretty cool, too. Check out the official Wizards site for information on Scars of Mirrodin, and keep an eye on MTG salvation if you like set spoilers. Rich? Check out Starcity Games and start buying spoiled cards at horribly over-hyped prices. Top: Geth of the Vault, with Phyrexian enhancements. 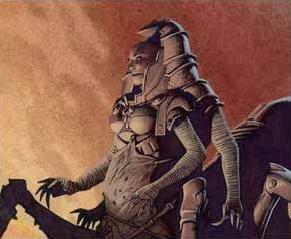 Bottom: Tsabo Tavoc, commander of the Phyrexian invasion force. Interesting, no?